A positive start to 2017 with sales up 156% on the first quarter of 2016. 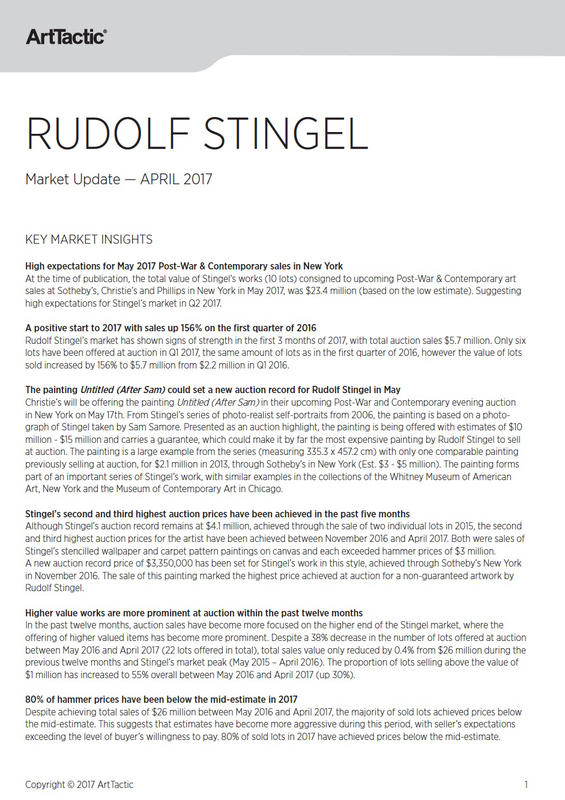 Rudolf Stingel’s market has shown signs of strength in the first 3 months of 2017, with total auction sales $5.7 million. Only six lots have been offered at auction in Q1 2017, the same amount of lots as in the first quarter of 2016, however the value of lots sold increased by 156% to $5.7 million from $2.2 million in Q1 2016. 80% of hammer prices have been below the mid-estimate in 2017. Despite achieving total sales of $26 million between May 2016 and April 2017, the majority of sold lots achieved prices below the mid-estimate. This suggests that estimates have become more aggressive during this period, with seller’s expectations exceeding the level of buyer’s willingness to pay. 80% of sold lots in 2017 have achieved prices below the mid-estimate. High expectations for May 2017 Post-War & Contemporary sales in New York. At the time of publication, the total value of Stingel’s works (10 lots) consigned to upcoming Post-War & Contemporary art sales at Sotheby’s, Christie’s and Phillips in New York in May 2017, was $23.4 million (based on the low estimate). Suggesting high expectations for Stingel’s market in Q2 2017. This Market Update follows on the Stingel Market Report published by ArtTactic in January 2017. TOTAL SALES 2006-2017, INCLUDING INFORMATION ON UPCOMING MAY AUCTIONS IN NEW YORK. ARTWORK SERIES FOCUS: STENCIL PATTERN PAINTINGS.